This week, the hockey world lost a bright little sparkplug named Scorch (a.k.a. the "Killer AHL Mascot." As the frontman for the Adirondack Flames, Scorch was designed to keep the home-fires burning--literally: this fictional character proudly stood up for house fires in his hockey market and, presumably, the world in general. "We need to stop infernos from becoming victimized by the brutality of firefighters," said the arsonist who designed this character sketch. Yes, apparently Scorch is the sole survivor of that reckless fire that shone so brightly only to burn out in its prime. But, as the saying goes among conflagrations, "Burn fast, quash young, and leave a smoldering corpse." As the only surviving part of that hallowed (?) 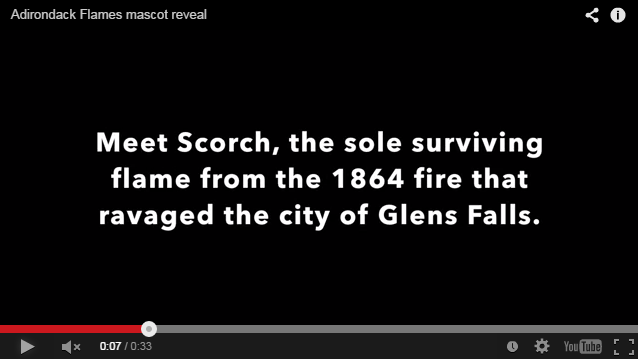 fire of 1864, scorch is presumably responsible for the fires that ravaged Glen Falls in 1884 and 1901 respectively. Thus far I haven't been able to confirm if Scorch was the son of fires that also ravaged this area of New York state during the French and Indian War or the American Revolution. Personally, I suspect that Scorch is actually part dilophosaurus. Since this area has been a real hotbed for fires, it's somewhat puzzling that a team would choose a destructive blaze as its mascot. Perhaps some insensitivity alarm should have gone off in the boardroom when Adirondack's brain trust convened before the mascot's approval and asked, "Will the residents of Glens Falls resent us for transforming their towns fiery destruction into a smiling, dancing mascot?" Maybe the Glens Falls crowd is super chill with the flaming destruction of their township, but my gut tells me that some felt about Scorch the same way that residents of Boston would react if the Bruins "commemorated" the Boston Molasses Disaster by redesigning their mascot as a corpse encased in syrup (Suggested nickname, "Candied Mummy"). Perhaps I am erring on the side of cultural sensitivity. After all, Scorch made the Adirondack Flames one of two professional, North-American hockey teams named after the burning of American cities. The other team is, of course, the Calgary Flames, whose moniker recalls the "Burning of Atlanta" during the American Civil War. With the extinguishing of Scorch, it's hard to imagine how parents on the east coast will teach kids to disregard let alone willfully impede fire safety. Thanks to a bunch of complainers who have nothing better to do than watch out for sports mascots that might encourage pyromania among today's youth, Scorch will no longer be around to joke around with them at games, teaching them that playing with fire is wholesome family fun. Such joyous endangerment of children has not been seen since biblical times, when Canaanites and Phoenicians sacrificed their children by fire in the hopes of appeasing the pagan deity Moloch. Yes, Adirondackian children have lost must with the snuffing of Scorch, but the people who lost the most from Scorch's demise were the many abusive football players who didn't look quite as monstrous compared to Adirondack's spirited slayer of firemen. (Well, technically "fireman," but by the look on his face in the picture above, you can bet that Scorch would've struck again if given the chance). 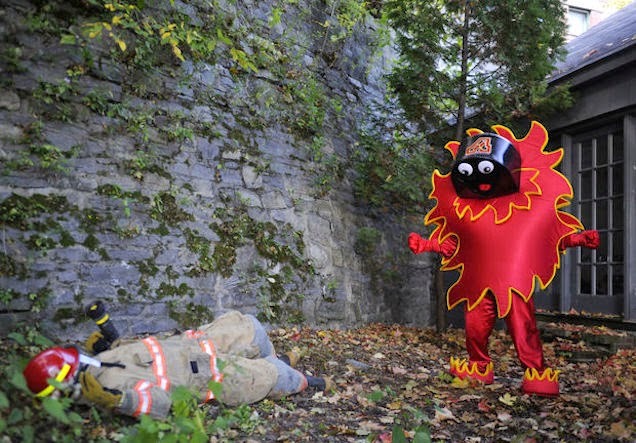 So, on this sullen autumn day, let's all take a moment to commemorate the passing of Scorch. Personally, I recommend listening to the original version of Elton John's "Candle in the Wind" in a dark room, cuddled up with a fire blanket. Scorch, we hardly knew ye (because the Flames organization realized that you were a complete PR disaster that had to be snuffed out immediately before engulfing the franchise in a conflagration of controversy).